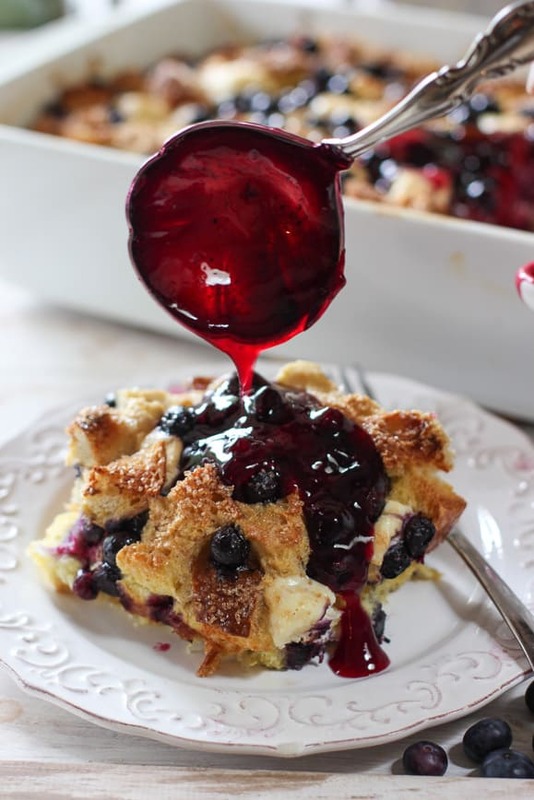 Blueberry and Cream Cheese French Toast Casserole! 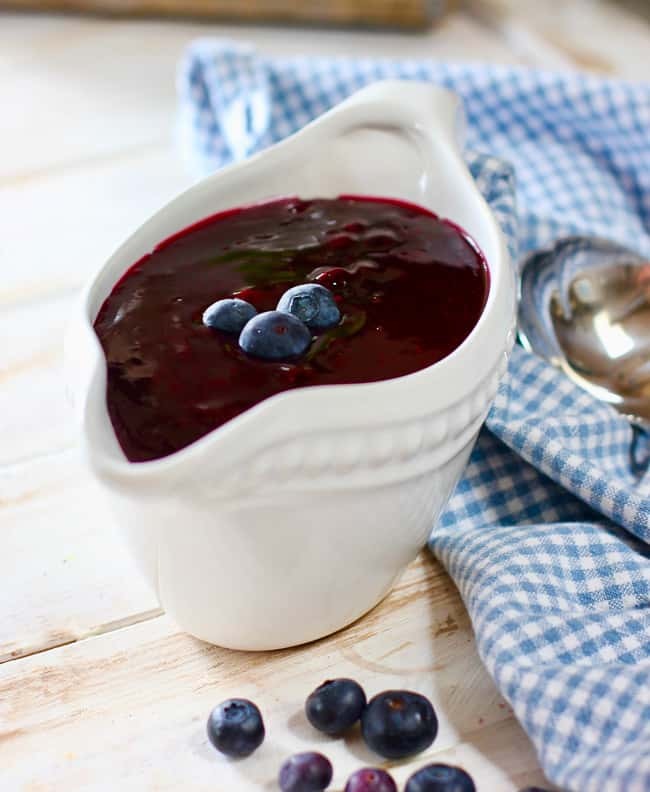 – With the easiest homemade blueberry sauce ever! We love this brunch casserole and so do our guests! You make it the night before and just pop it in the oven in the morning. If I was a blueberry…this is how I’d like to be remembered :). I’ve been thinking about this recipe for some time and I was saving it for special. Special is here! It’s the first dry day in like forever in Seattle and I’m feeling all carby and stuff. I’m not sure what that means, but if carby is a feeling…I’m having it. These particular carbs come with fruit…it’s all about balance ya know. 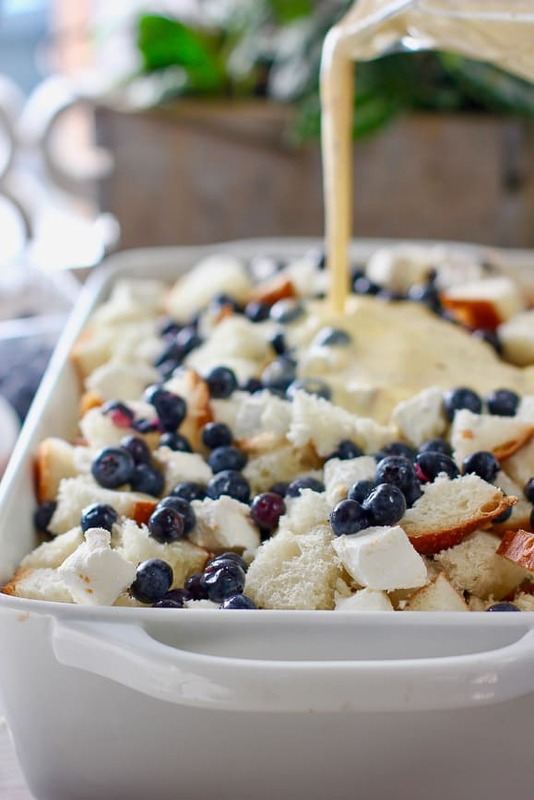 How to make delicious Blueberry and Cream Cheese French Toast Casserole! First, the bread. I used a loaf of the stuff they bake up at your local grocery store. Cheap and cheerful! But you can sub with brioche or texas toast type if ya wanna get fancy. 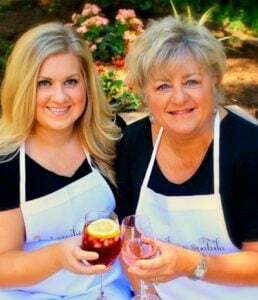 Anything that you can cut into big chunks. If you can find day old bread, even better. Or just leave it out overnight if you have the time. 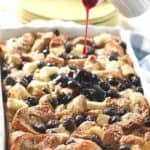 What would I serve with this Blueberry French Toast casserole? TIP: Freeze your cream cheese for 15 minutes before cutting into cubes. You will be glad you did, cuts so much easier! Water, sugar, cornstarch and blueberries. Thats it! Whisk it up in a sauce pan until it’s simmers and done. It makes a big batch because who wants to run out of syrup? Can I make the blueberry sauce in advance? Yes! Simply cool it to room temp and store in the refrigerator. You can make this up to 3 days in advance. Here’s a video to show you how we made this delicious Blueberry French Toast Casserole with Fresh Blueberry Sauce! The egg and bread has to sit at least 2 hours or overnight. Can be made up to 2 days in advance. Freeze the cream cheese for 15 minutes to make cutting into cubes much easier. 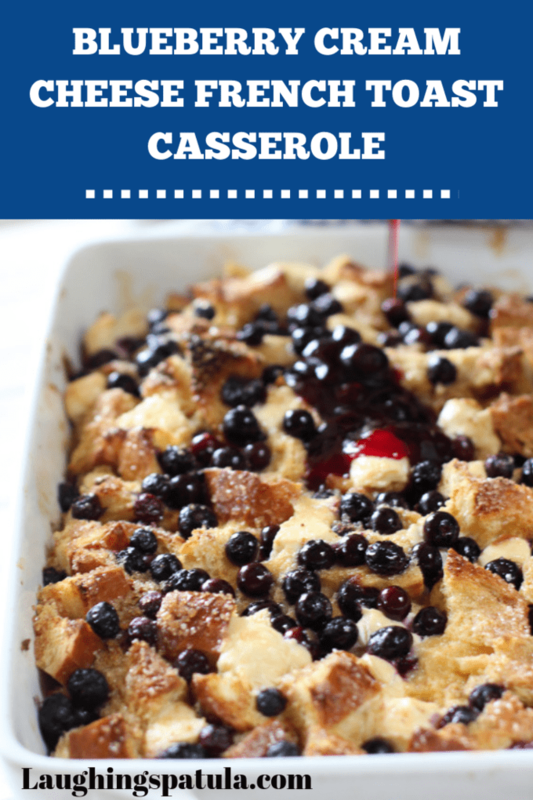 Comes with a blueberry sauce recipe that takes only 10 minutes, is super simple and makes enough to out last the last bite of this casserole …thats always a problem with sauce isn’t it? Never enough. But I got ya covered on this one! We used fresh blueberries, but frozen is okay. (If using frozen, just toss them in 2 tablespoons of flour, so they don’t bleed all over your pretty little casserole. After tossing them in the flour, shake off the excess). But fresh is best for this recipe. We sprinkled it with raw sugar so the top was all crunchy and stuff…yum. If your feeling like a savory brunch casserole…try our Easy Breakfast Casserole. Made with sausage, egg, cheese and frozen hash brown cubes. Who knew there was such good stuff in the frozen food aisle! Check out all of our Breakfast and Brunch Recipes HERE! What do you think about this recipe? Have questions? Comment below! Don’t forget to like us on Facebook, and connect with us on Instagram and tag your @Laughingspatula recipes with #laughingspatula, while you’re at it…We love to see your pics! An overnight breakfast or brunch casserole that comes together quickly along with an easy recipe for Blueberry syrup! Butter a 9 x 13 casserole dish. 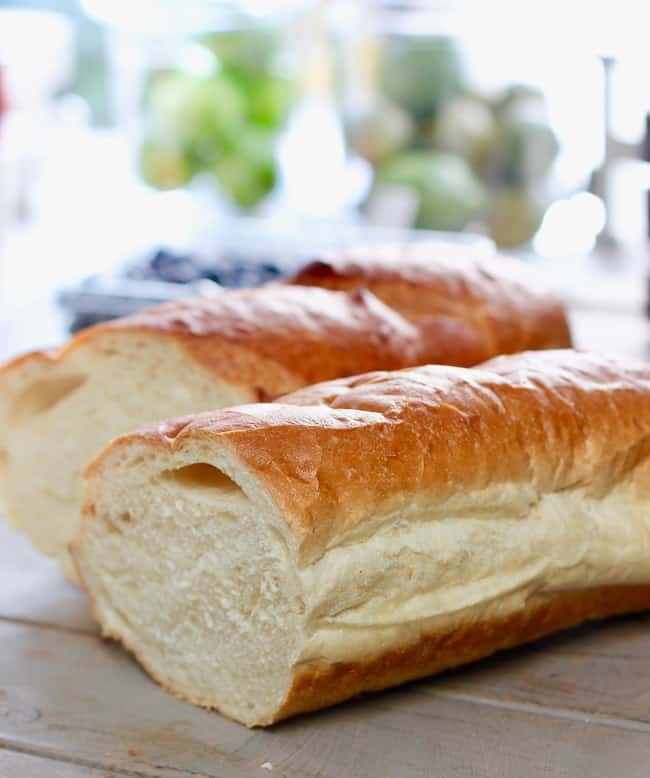 Cut french bread into 2 inch cubes and set aside. In large bowl, combine eggs, half and half, sugar, cinnamon, vanilla and salt. Whisk until completely mixed. Put one half of bread cubes in prepared dish. Top with half cream cheese cubes and half cup of blueberries. Add remaining bread cubes and top with remaining cream cheese and additional half cup of blueberries. Pour egg mixture over bread cubes. Pressing mixture down so completely soaked by egg mixture. Cover with plastic wrap and store in refrigerator for at least 2 hours or up to 48 hours. Remove plastic wrap and sprinkle casserole with raw sugar. Cover casserole with foil and bake for 30 minutes. Remove foil and bake an additional 20-30 minutes or until center is firm and bread is slightly brown on top. Cool slightly and serve with blueberry sauce. In small saucepan, combine sugar, water and cornstarch until simmering. Add blueberries and simmer for 10 minutes. Using a fork or whisk, slightly break up the blueberries to desired consistency. Cool slightly before serving or store in refrigerator for up to 3 days. Make in advance. The egg and bread has to sit 2 hours or overnight. Can be made 2 days in advance. Freeze the cream cheese for 20 minutes to make cutting into cubes easier. 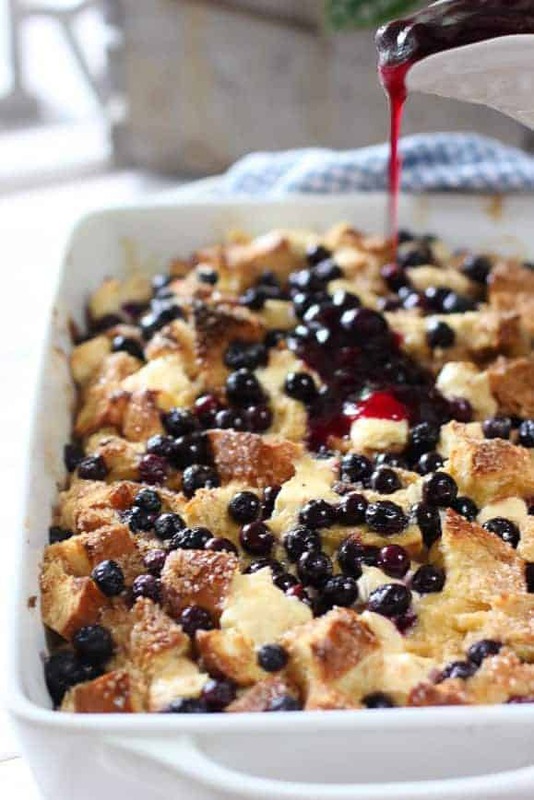 Comes with a blueberry sauce recipe that takes only 10 minutes, is super simple and makes enough to out last the last bite of this casserole ...thats always a problem with sauce isn't it? Never enough. But I got ya covered on this one! We used fresh bluebs, but frozen is okay. (If using frozen, just toss them in 2 tablespoons of flour, so they don't bleed all over your pretty little casserole. After tossing them in the flour, shake off the excess). But fresh is best for this recipe. We sprinkled it with raw sugar so the top was all crunchy and stuff...yum. Making this tomorrow for Easter breakfast – using regular bread though- hope it’s still just as good! It should be fine…might be a little bit softer is all and not the definition of the big chunks. No worries…should be great! This would make for a perfect easter morning breakfast. I never have made a baked french toast casserole before – but it is something I must try! yum! french toast are one of my favourite breakfast during the week end and this casserole looks delicious! Thank you! Hoping you get a chance to try it! WOW I love how you incorporated cream cheese to this already sinfully YUMMY recipe! Genius! I would love to take this to a brunch, but I’d love it more if I could eat it without sharing! Thank you for the nice comment Renee! This looks delicious and would be perfect at my next brunch!! Thanks Sam! Hope you get a chance to try it! Enjoy your moment Sarah :)….Thanks for the note!